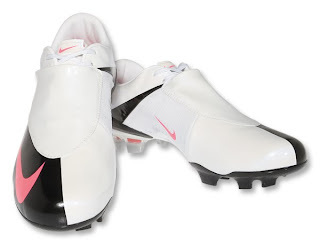 I was wondering which new Nike boot to mention here: Vapors, Legend or Superfly. Then it hit me - Let's do all 3! The new Vapors feature soft, supple Teijin microfiber upper that adjusts to the shape of your foot. Covered lacing increases ball contact area. Flywire technology in the arch areas provides great support without adding weight. The insole includes contoured speed last mirrors the foot shape. Inner chassis creates instant acceleration. Contoured sock-liner with EVA inserts. The sole is composed of direct-injected heel studs for weight reduction. Weigh only 8.4 oz. These classy boots include premium hand-stitched kangaroo leather upper for excellent comfort and ball feel. Updated quilted vamp design for improved fit and control. Re-engineered heel for extra comfort and support; high performance molded sockliner insole with Poron cushioning for comfort. The sole is made of lightweight TPU with glass fiber shank and forefoot flex grooves. Combination conical and bladed studs for traction and pressure dispersion. 6.8 ounces built for speed, that pretty much says it all right? The Nike Mercurial Vapor Superfly is a slick boot with innovative Flywire technology, carbon fiber outsole, vented insole, and cored-out studs for the lightest boot to ever hit the field. That Superfly shoe looks fantastic.